WhatsApp is one social network app that took the world by a storm. This free app can be downloaded on smartphones including iPhone. 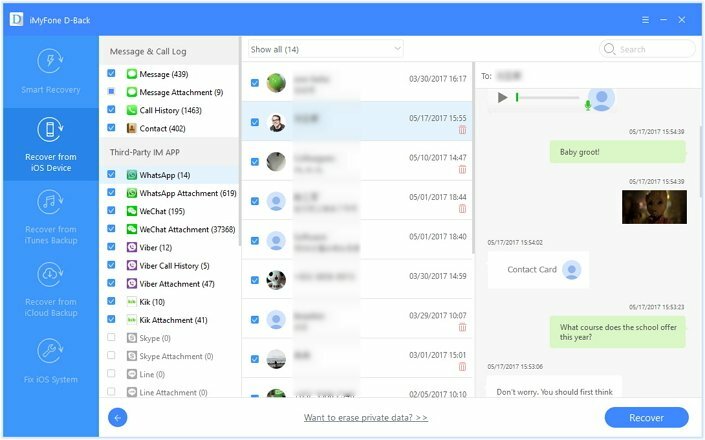 This messaging app uses the Internet to send messages, audios, videos, and documents and even make calls. In the event of using your iPhone, you may accidentally delete all WhatsApp attachments and you realize that you need get them back. What you need to do is to look for an iOS recovery tool that will restore all WhatsApp attachments of your iPhone. In this article, we will show you how to do so. iMyFone D-Back iPhone data recovery or its Mac version program is a powerful software that you can use to restore WhatsApp attachements. 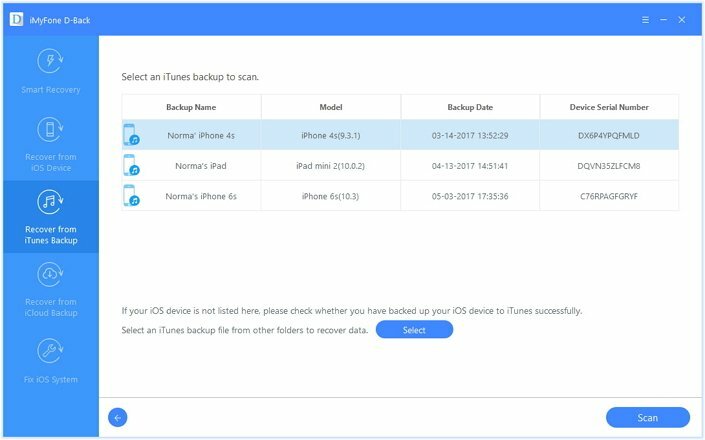 With this program, you can scan the deleted files from your iPhone directly or extract them from backup files. This lightweight software supports multiple data types that you could have possibly lost in any case. Here are some of its key features. Built in with four recovery modes; Smart Recovery, Recover from iOS Device/iTunes Backup /iCloud backup. It supports to recover lost iPhone Kik messages, WeChat messages, contacts, call logs, notes, videos and much more. 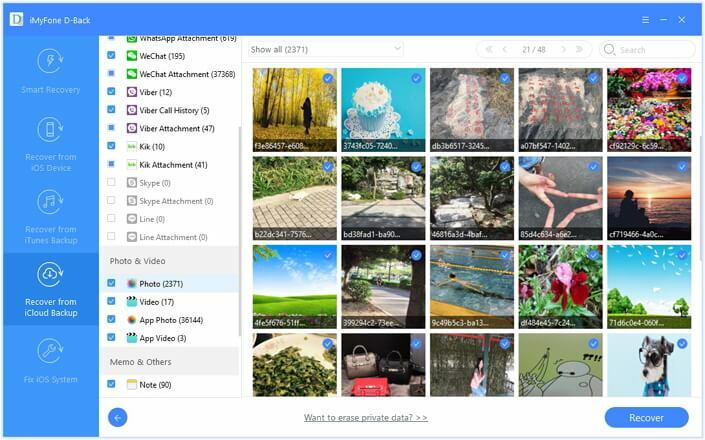 It supports data loss scenarios like accident data deletion, virus attack, broken devices, disabled iPhone, system inaccessibility, factory reset and others. It supports iOS devices running iOS 10/9/8/7, even the latest iOS 10.3. It is built with Fix iOS system feature that allows you to repair iOS devices that display white screen, Apple logo, black screen, and those stuck in recovery mode. 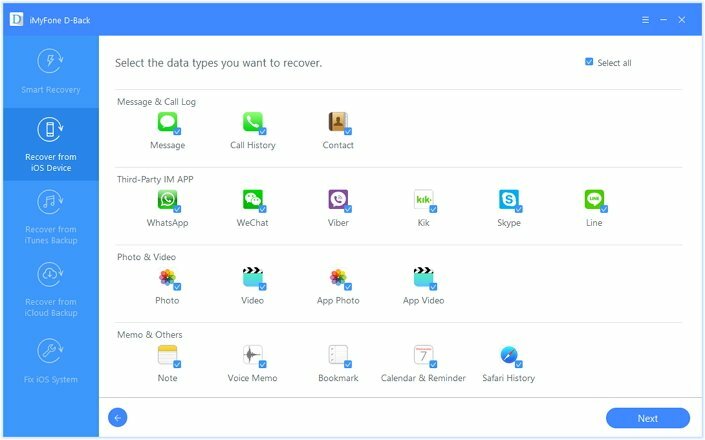 Now let us see three ways you can recover WhatsApp attachment on your iPhone using iMyFone Data Recovery software. When you don’t have a backupfor your iPhone, you will have to scan the deleted WhatsApp attachment directly on your iPhone using "Recover from iOS Device" mode. Step 1. 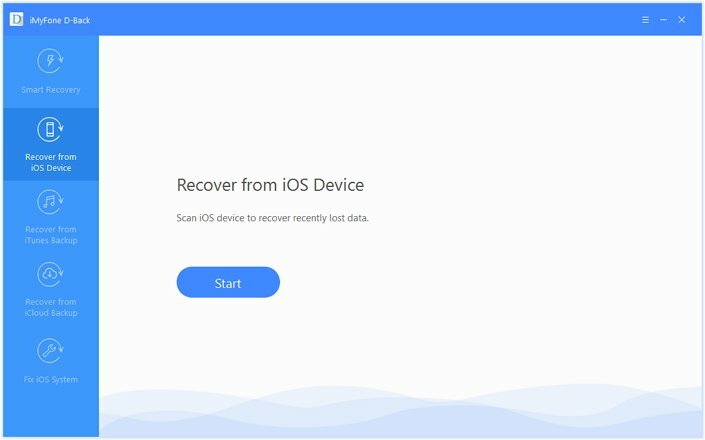 Choose "Recover data from iOS Device"
On opening the installed software, you can click on "Recover from iOS Device" option. After that click on "Start" button to begin choosing the file types to scan. Under third party IM app, tick on WhatsApp attachment. From there you can now connect your iPhone to the computer using a USB cable and click on "Scan". When the scanning is complete the program will display all WhatsApp content of your iPhone. Click on WhatsApp icon and you will find the WhatApp attachments. Go through each attachment. When you are satisfied mark on those that you want to restore and click on "Recover" button. This will allow you to save the recovered files on your computer. If you had synchronised you iPhone with iTunes then you recover from iTunes backup by following these steps. Step 1. Click on "Recover from iTunes Backup"
For this method you don't have to connect your iPhone to the computer. Just click on "Recover from iTunes Backup" and then click on "Start". On the next window that appears you have to select the file type to restore. Tick on "WhatsApp" icon and then click on "Next". From there, click the backup file to scan and click on "Scan" button. Once the scanning process is over you can now go through the retrieved WhatsApp files. Click on each file attachment to see if it is exactly what you want. Next, mark on the desired WhatsApp attachment and click on "Recover" button. For this recovery mode, you should have done a backup of WhatsApp to iCloud account. To begin with click on "Recover from iCloud Backup" option and click on "Start" icon. You will be able to mark the file types that you want to restore. Ensure you have marked on WhatsApp icon. 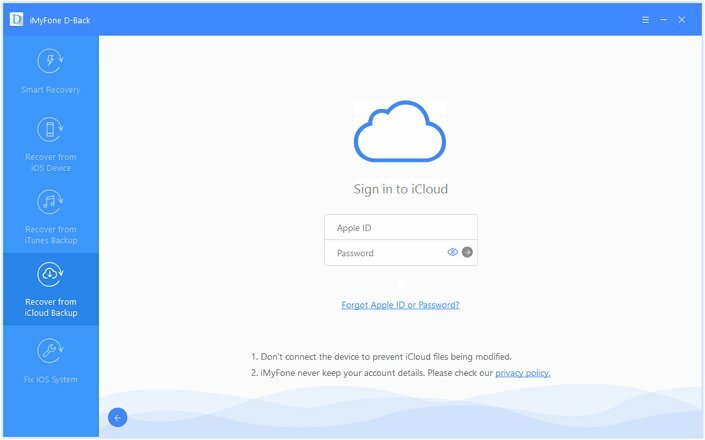 When you click on "Next" a window will appear that lets you log in to your iCloud. 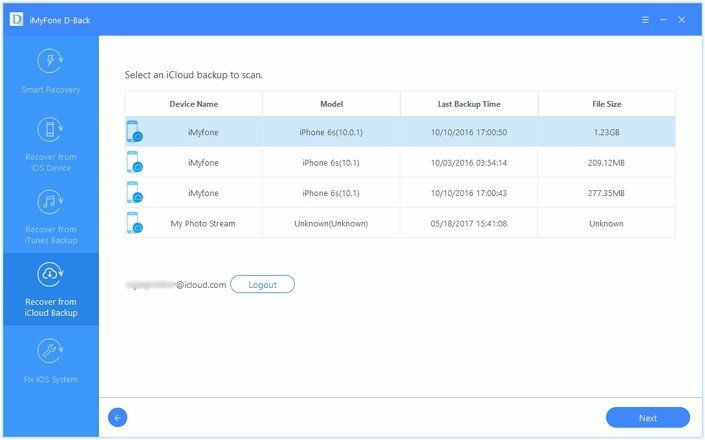 Now that you are signed in to your cloud account, choose the backup file to scan and then click on "Download". Once the backup file is downloaded you will have to scan the downloaded backup file. Next you can now preview WhatsApp attachments by click on its "WhatsApp attachment". You can the check on the attachments that you want to restore and complete the action by clicking on "Recover". You will be able to restore the files to your computer. 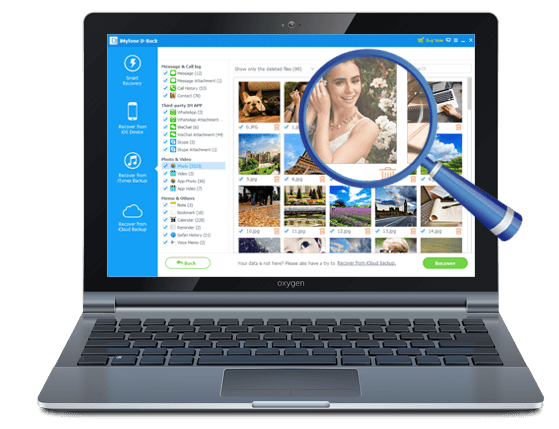 Now download iMyFone D-Back iPhone data recovery Windows version or iPhone data recovery Mac version to get back the deleted WhatsApp attachments on your iPhone.